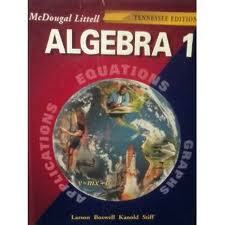 In Algebra we use the McDougal Littell Algebra 1 text book. Click here to visit the Classzone website which has online videos, extra examples, more practice problems, and lesson specific games. It also has practice quizzes and tests for each section and chapter of the book which can be done at home to help improve test taking abilities.